Since my baby girl is in this new phase of not wanting to be restrained in anything, she just wants to crawl allll over the place. Not wanting to be in her car seat, highchair, diaper changing table or stroller. She's been crawling for a couple of months now, but it seems that each day she is being more and more adventurous in her exploring and wanting to be 'free'! For instance, last night when we went to dinner, she did not want to stay put in her highchair for long at all. She started crying and kicking the chair. We were 'those people' that the other diners were glaring out. She had eaten, had plenty of sleep and a clean diaper, so we figured she was just going through 'that stage'. We each took turns taking our baby outside to calm her down while we ate our cold dinner. Awh, the joys of parenthood. And today in her Kindermusik class, she did not want to sit in my lap and sing songs :( She took off all over the place. Examining the room, crawling towards the other moms and babes, looking at the windows and pulling up to the teacher's table. I so wanted her to participate in the mommy and me activities, but she wanted no part in it. Our teacher said it was normal at this stage and they all start to explore the room, but it was still hard to know she is past the sitting still in my lap phase and starting the "Miss Independent, Don't Tell Me No" phase. Did you think before you had kids, you would see the children in restaurants throwing fits and temper tantrums and hoping one day that would not be your child? Or you were at the area Walmart witnessing a melt-down and thinking that you would be different, and hope not to have that crazed whiny child when you one day became a parent? I know all children have melt-downs and temper tantrums and I've posted several times on that topic, but it is still hard to watch your child go through the beginnings of that phase. Having these 'fits' as people call them, is a normal stage that all children go through. Just as all kids go through the sitting up, then crawling phase or the babbling before speaking phase. Developmentally, all kids need to test limits as they are learning and exploring their environment. But as a play therapist, sometimes I have to wonder what other people are thinking of me and my child. Like am I always being watched to see how I react? If my child acts out, will they think I don't know what I am doing and lose credibility? Hopefully people will realize that all children have fussy times, temper tantrums and act out. 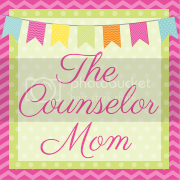 Just because I am a counselor does not mean my children will be perfect at all times, or that I will be either! AND to remember that children act out more when in the presence of their parents than anyone else. Why? Because they feel safer to act out when around those they trust. Ever wonder why your child is an angel for the grandparents or babysitter? Yep, they don't test their limits around them as much, just their parents. So for now I am letting my girl have as much active play time at home in her safe, baby proofed play area. But having to make any driving and eating out experiences super quick! She is probably sick of hearing, "I know you don't want to get in the car seat, but we have to be safe and buckled in when we ride in cars. We'll get out shortly and play soon." Amen sista! I went thru that with my kids too, hang in there! It gets easier. Thanks Kris. I know some phases get easier here and there, but of course we aren't even in the Terrible 2's yet. I am hoping to have a positive attitude about them and excited to see how my limit setting works or doesn't work when the time comes!